“A Second Chance At Eden” is a shot story collection set in the same universe as the Night's Dawn Trilogy. The earliest story takes place in the near future, the latest a few years before the start of “The Reality Dysfunction”. The stories are only loosely connected to the trilogy - aside from a couple of cameo appearances from familiar characters – and mostly deal with the consequences of Hamilton's affinity technology, and the Edenist culture that uses it. 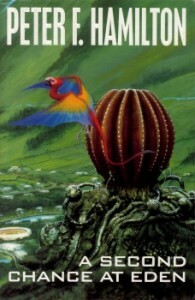 The longest story is the title novella “A Second Chance At Eden”, which is set in the early days of Eden, the Edenist's first habitat situated in orbit around Jupiter. Eden's founder Wing Tsit-Chong is about to embark on the next stage of Edenist development, but the fledgling colony is thrown into turmoil after one of Eden's most prominent scientists is found dead – shot by one of the habitat's animal servitors. Eden's new security chief, newly arrived from Earth, has to investigate who managed a seemingly untraceable murder in one of the most closely-monitored locations in the Solar System. Unfortunately for him, the dead scientist had plenty of enemies and rivals, and the murder was planned with great precision. His problems don't stop with the case, his wife becomes increasingly disapproving of the Edenist culture, as a religious woman she can't reconcile her husband's acceptance of the affinity technology with the Pope's decree that the technique is immoral. The story offers an interesting insight into Edenist culture and the murder plot has a few interesting twists, but the story is too slow-moving and ends up being slightly dull, despite a great ending. The best story in the collection is “Escape Route”, which tells the tale of Marcus Calvert, father of the main character in the “Night's Dawn Trilogy”. Calvert and his crew, aboard the starship Lady Macbeth, are hired by some suspicious characters on a mission to a remote, uninhabited, star system. While there, they stumble upon an ancient alien spacecraft but problems arise when the tension between Calvert and his employers breaks into violence. It's an entertaining adventure story, with some nice alien technology. The rest of the stories tend to be quite average, there are a few nice moments but generally they aren't all that memorable.